There are several bands with this name: a Swedish viking rock band, an Estonian hard rock band, and a black metal band from China. 1. Ultima Thule (Swedish band) are one of the oldest and most popular bands from the Viking-Rock genre. Most of their songs are about Nordic mythology, patriotism and the beautiful landscapes of the north. 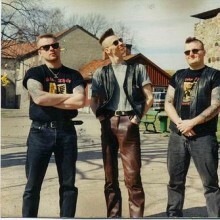 Ultima Thule are an apolitical band, altough early in their career they had some connections to far-right political organisations and bands. There are several bands with this name: a Swedish viking rock band, an Estonian hard rock band, and a black metal band from China. 1. Ultima Thule (Swedish band) are one of the oldest and most popular bands from the Viking-Rock genre. Most of their songs are about Nordic mythology, patriotism and the beautiful landscapes of the north. Ultima Thule are an apolitical band, altough early in their career they had some connections to far-right political organisations and bands. Ultima Thule are one of the few bands in Sweden that simoultaniously have had 3 albums and 2 singles on the TOP 20 saleschart. Their latest album was entitled: "Yggdrasil". 2. Ultima Thule (Estonian band) are a rock band. They formed in 1986. The leader of the group has been the guitarist and (later) singer Riho Sibul. Ultima Thule has been one of the most influential Estonian bands of the 1980s and 1990s. Their style has been characterized as a blend of blues-rock with witty lyrics and influences of Estonian folk-music. The original singer of the band, Tnis Mgi has in the 2000s mainly chosen a solo career as well as the former drummer Peeter Jgioja (featuring also in 2004 Eurovision song contest with the group Neioks). 3. Ultima Thule (Chinese band) are a black metal band and participated in the "A Tribute To Burzum: Triumph und Wille" with song En Ring Til Å Herske. Respected readers if you are reading this, you clicked on the page of the recording artist ultima thule in our eLyricsWorld. Our database has disposal of information about 52389 artists worldwide as well as 829824 songs 156 of which are from ultima thule. Except for the singer's biography, on this page you can see short piece of information about them, covers date of birth, style, label Be versed in all the news around ultima thule by adding RSS link. If you prefer you could directly visit the address you are on currently and look through what's new and latest songs about the singer.